At Alpine Truck Accessories, we are concerned with more than just protecting the bed of your truck. Whether you are on the job, on the hunt, or just out on the trail, we have the off-road accessories and truck parts you need to protect your vehicle. Roof Racks – Stow more on the go with a variety of roof racks, each built to hold up under pressure for all of your journeys. Grilles – Keep your vehicle protected and stylish with this front-facing truck accessory. Our off-road parts are designed to hold up to the harshest conditions. Fender Flares – Whether you’re hoping to enhance the cool factor of your truck or customize your well clearance for larger off-road tires, these babies will get the job done. Lights – Illuminating your adventures may prove the difference between a successful conquest and a costly outcome. From light bars to headlights, spotlights, and more, our truck shop has you covered. Bumpers – You can rely on our local truck accessories to keep your beast armored from a wide range of dangers while also enhancing the aesthetics. Bed Liners – As an experienced and certified LINE-X installer, Alpine Auto Accessories can enhance your ride for the long haul with durable spray-in bedliners. Winches – True off-road enthusiasts rely on a winch system to get them out of tough situations. Our truck winches can mount anywhere, giving you the power to get your truck or a friend’s back on the trail. Lift Kits – Who would’ve thought looking cool could be so beneficial, too? Our off-road truck lift kits are designed to provide clearance and cushion when you’re behind the wheel. Side Steps – Lifting your truck is great, but if you can’t climb in, what’s the point? Our truck steps are built to provide access to off-road machines of all sizes. Wheels and Tires – Your lift kit will allow for premium truck tire upgrades. The shoes on your 4×4 will help in establishing control both in inclement situations and in aesthetics in town. Body Armor – Trucks that take on the worst will often be at the highest risk for sustaining costly damage. Our LINE-X liners and truck armor products work to provide optimal protection for your machine in a wide range of environments. Don’t see the truck accessories you are looking for? 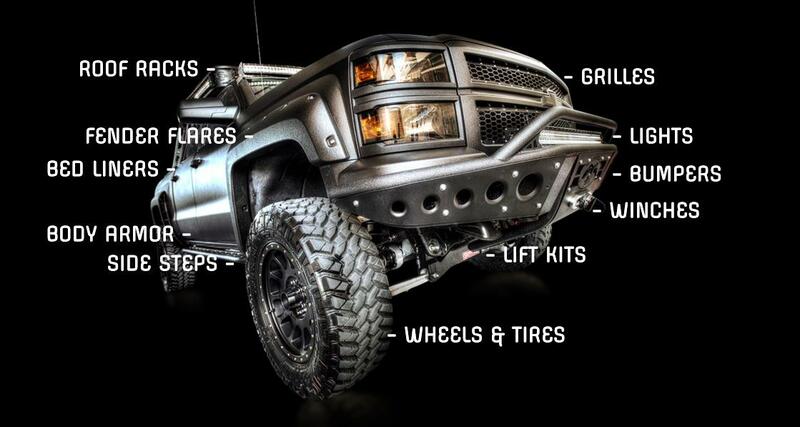 Contact us today to find all of the cool truck accessories to meet your needs!